Idles about and occasionally sits down. Rarely stomps on the ground, creating a green, telegraphed area. Responds to the emotes /cheer, /talk, /roar, and /dance. Graves is a promotional pet from Blizzard's game Heroes of the Storm. To collect this pet, you must achieve player level 20 in Heroes. Players will receive Graves in the mail from Breanni with the following message, "We found this little "thing" wandering around the Duskwood Cemetary, collecting skulls. Being the Harbinger of death and destruction that you are, we thought you'd be the perfect owner for this tiny macabre monstrosity!" Players that obtain Graves earn the achievement Hero of the Storm. I wanted to confirm i got this pet 8/27/18. The levels are easier to get for heros of the storm now just level a bunch of lowbie characters and each level for the characters is a player level. I had the lvl 20 cap in a couple days just some fyi for anyone else still looking to get this pet. I just got this pet 12/11/17 so it's still obtainable. I was dreading the grind, At level 11 I figured out I could get a player level for each level 1 character I got to level two (about one game with stim pack) and knocked out the last 9 levels very quickly. Good Luck. Got it today, and after the changes they made to the leveling system it's WAY easier. Just level champions a combined 20 levels. With the free 20 champ bundle that's 60 easy ai games or less. 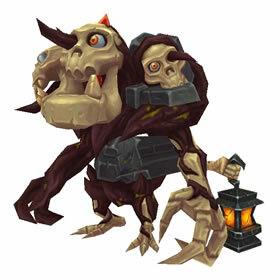 This pet used to be very strong in WoD, because it could AoE teams down easily. However it got nerfed in legion. The Grave Destruction has been switches with Consume Corpse, which allows you to only take 1 AoE ability instead of 2. Not as good anymore. Still hits hard against humanoids though! i dont know if this pet was a better pet as it is in legion, but the rating really does'nt match the pet. I think it must be re-evaluated, and every pet that has its stats or behaviour changed, should be also. I can confirm this pet is still available as of today. Decided to download HotS for the promo mount, then decided to go ahead and use the Leoric strat all the way to 20. Is this pet still available ? Can a moderator please change this pet's battle rating as it has been nerfed to oblivion, and to save people the long hassle of getting this pet. @Quagga Yes, you can still get him. Got mine today after reaching level 20 in HoTS. The 3 heroes below can be used to AFK with to grind exp, but AFKing is only permitted if your enemy AND teammates are AI. Be sure to set your enemy AI as beginners as this won't affect exp you gain. Leoric: Resurrects where he dies. Abathur: Spawns an add every 15 seconds. Anubarak: Level 4 you can chose "Legion of Bettles" to cause a bettle to spawn every 8 seconds, but it despawns sooner than Abathur's add, so hide in brush or an area off to the side by the enemy's inner gates. If you're deadset on not actually playing the game and are gonna use the Leoric tip below, have the decency to make sure that you do it in games with and verses AI opponents. If you queue into games with real players it will be obvious that you are basically AFKing, and you will likely get reported. My wife (mojojoee@silver hand) and I decided we should get Graves, so we started playing Heroes of the Storm. Getting to level 20 took a couple of weeks of occasional play, and we lost many more games than we won (to the ire of our teammates). A funny thing happened along the way. As we started to understand more of the nuances of HotS, we really got into it. Give the game a fair chance - it's challenging and fun. Play in AI mode while you're learning so you don't hurt serious players. This Leoric tip sounds great, but can anyone tell me what you need to do to unlock him? As far as I can tell, when you start the game, you have one character to play with, and Leoric is greed out in the menu with all the other characters. In one invasion of the Haunted Mines, a team of heroes only managed to collect a single skull. The golem that resulted, too small to do much damage to the enemy towers, wandered off into the Nexus, eventually finding its way to Azeroth.